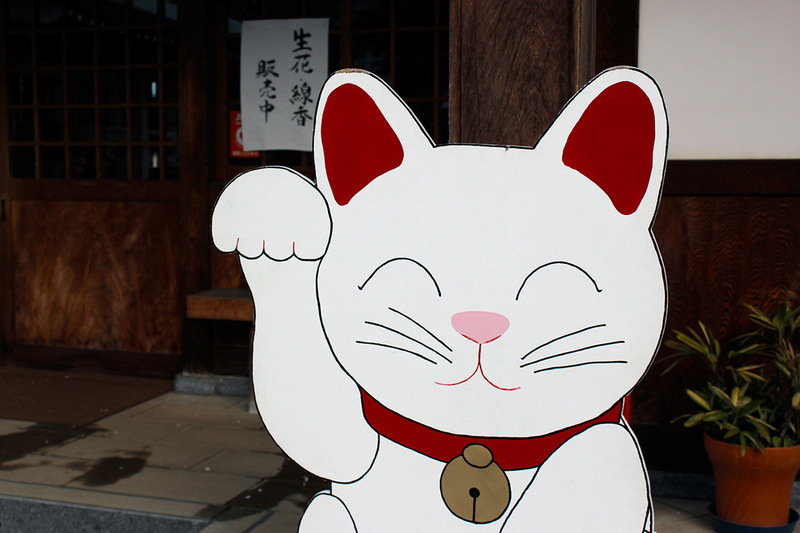 I'm sure many of us out there are familiar with the beckoning cat that greets customers in front of Japanese restaurants and stores. 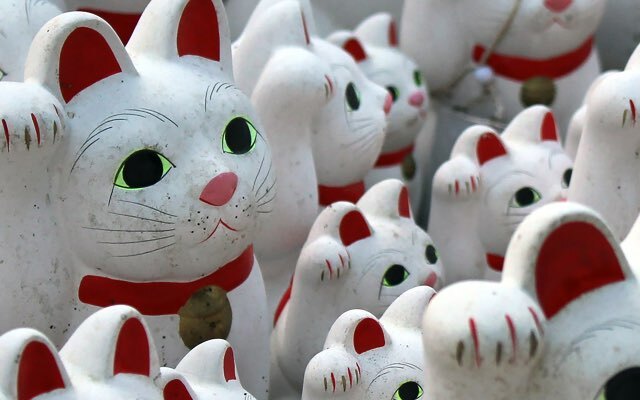 Known as the maneki neko, or literally "the beckoning cat", the small doll is believed to be a lucky charm that brings in customers and money into the shop. 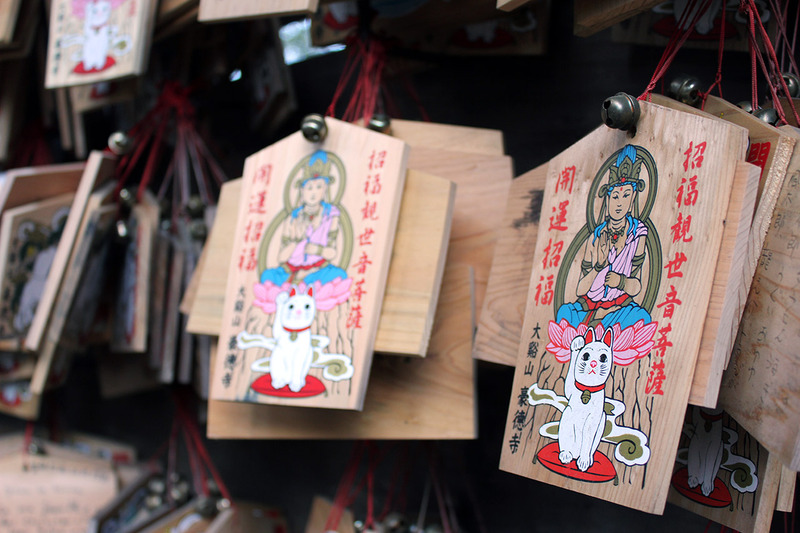 While there are several legends about the origins of this cat charm, one of the widely known story regards Gotokuji as the place of origin. Legend holds that the maneki neko originated back in Edo period, when a feudal lord from Hikone (a city in present-day Shiga Prefecture) passed by a temple in Edo. There, he met a cat that beckoned him to come into the temple. The lord followed the cat and decided to stop by the temple; soon after, a thunderstorm came by. The lord, who took shelter at the temple, became thankful of the cat's deed; eventually, he collected enough funds to rebuild and claim the temple as his family temple, which eventually became Gotokuji. 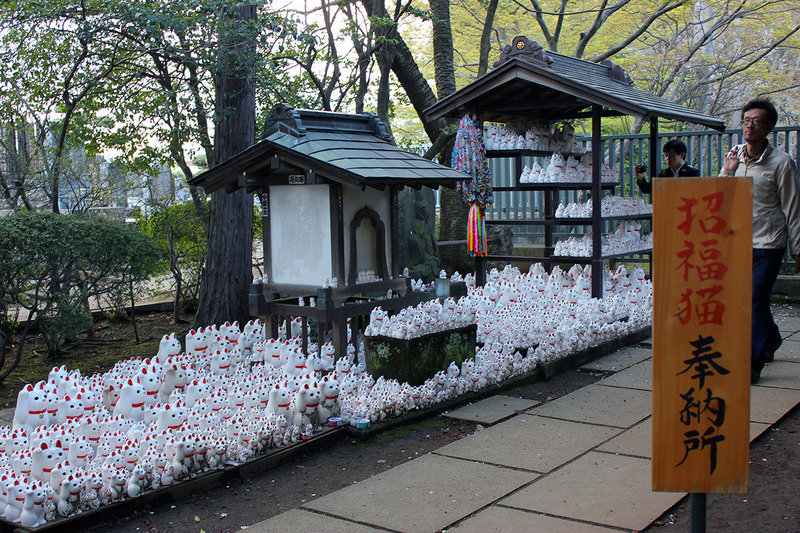 As time went on, people began to offer maneki neko figurines to the temple as a sign of gratitude when their wishes came true. 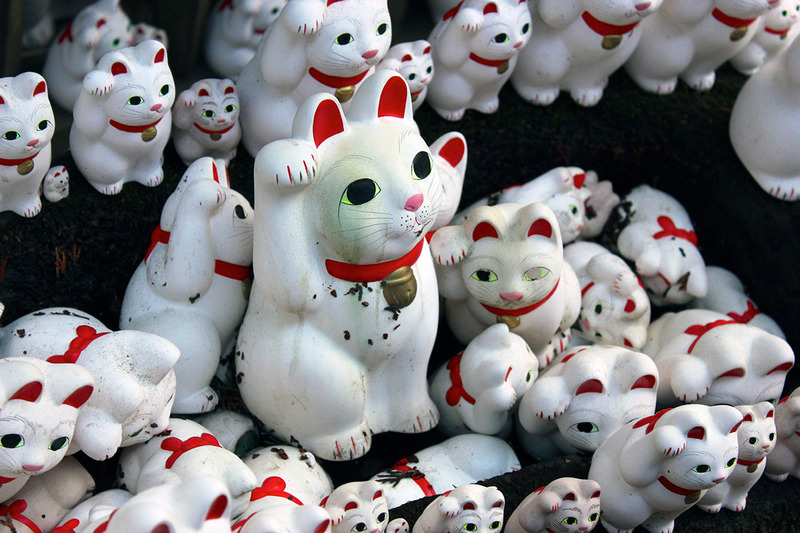 Today, the maneki neko is also considered to be the infamous model for the mascot of Hikone City, Hiko-nyan. 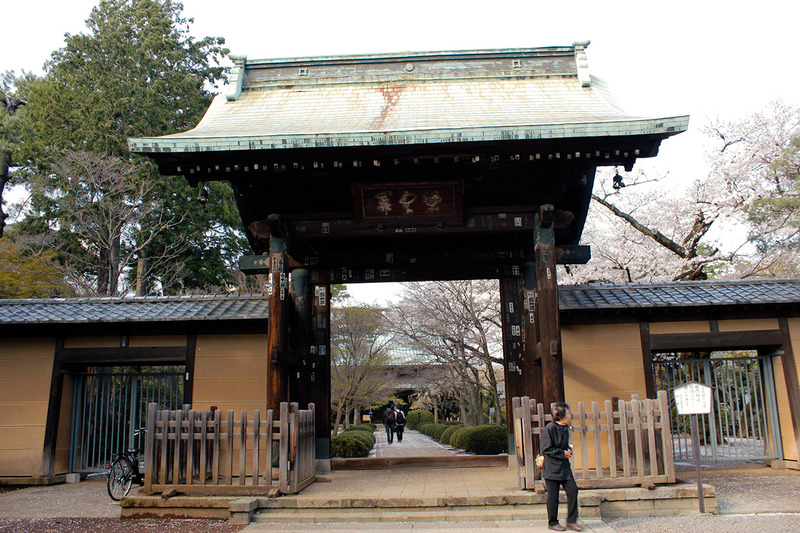 Gotokuji is located in the quiet Setagaya Ward of Tokyo, away from the hustle and the bustle of the city. Walk through the narrow residential streets for about 15 to 20 minutes, and you'll find the temple nestled away from the train tracks and major roads. The temple complex itself is very pretty, especially if you go during the spring season when the cherry blossoms are in full bloom (let's face it– cherry blossoms just makes everything so much better). 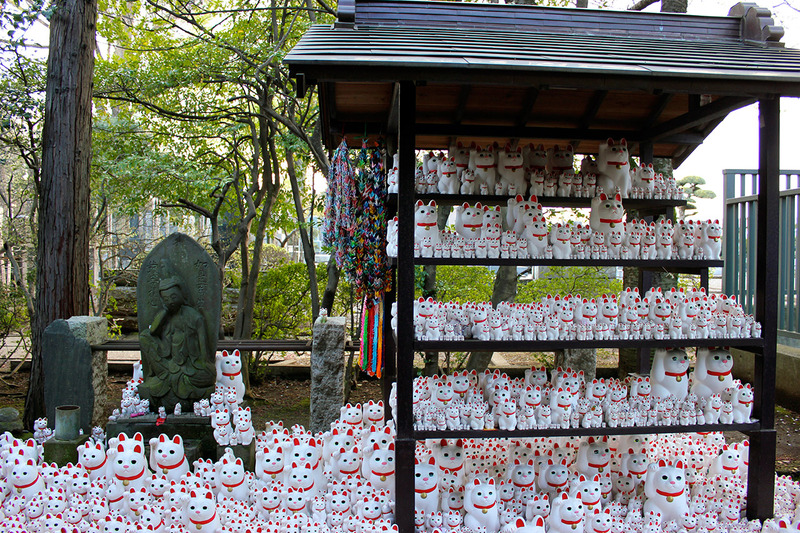 And then of course, there are the cats– waiting for you towards the corner of the temple in a small area with shelves dedicated to stacking as many cats as possible. They're even on the ema boards, which you can write your wish and hang for it to come true. Overall, the temple's definitely a great place to experience a different side of Tokyo, one that's away from the hustle-and-bustle of the city. It's in a quiet, nice residential area, surrounded by small mom-and-pop shops and narrow streets. 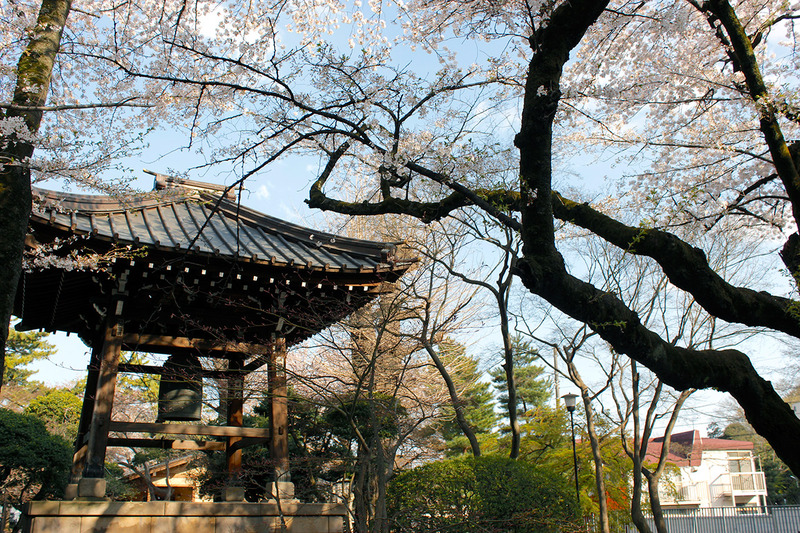 It's a beautiful walk from the station to the temple during the spring season when cherry blossoms are in full-bloom. If you want to check out a quiet, quirky temple instead of the various famous and tourist-oriented shrines and temples in Tokyo, Gotokuji might be a trip worth making! 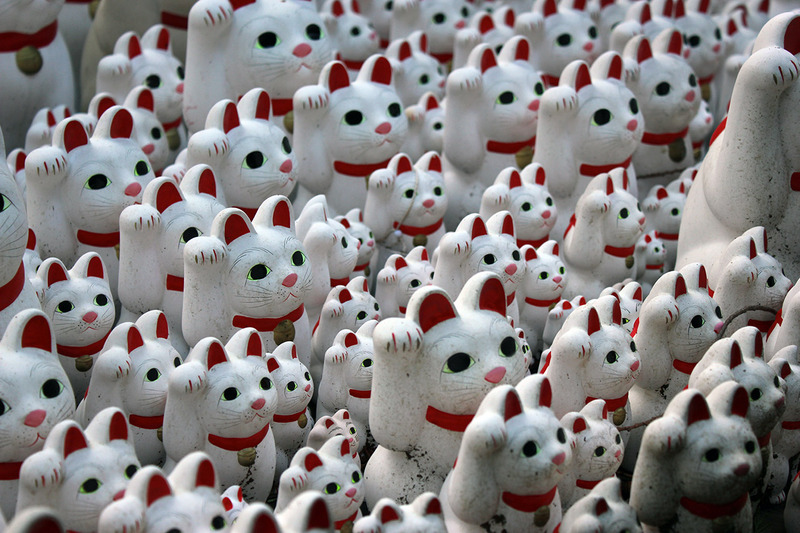 For those who love maneki neko. A bit far from the main tourist sites. Gotokuji Temple is in a residential area. Not much else to do here.